Washington-area office construction has been robust this year, with the D.C.-area ranking as the 5th-hottest office market based on new square footage delivering in 2018, and two area projects rank among the 10 largest nationally. WASHINGTON — Washington-area office construction has been robust this year, with the D.C.-area ranking as the 5th-hottest office market based on new square footage delivering in 2018, and two area projects rank among the 10 largest nationally. Commercial Cafe, whose data excludes new office buildings less than 50,000 square feet, says 23 large-scale office projects have delivered this year or will in the D.C. area, totaling nearly 6.3 million square feet. Capital One Financial’s new Headquarters II addition to its Tysons Corner campus, a 31-story, 971,000-square-foot, 470-foot tall tower at 1600 Capital One Blvd. — the tallest building in the Washington region — ranks as the 4th-largest office building project in the U.S. in 2018. 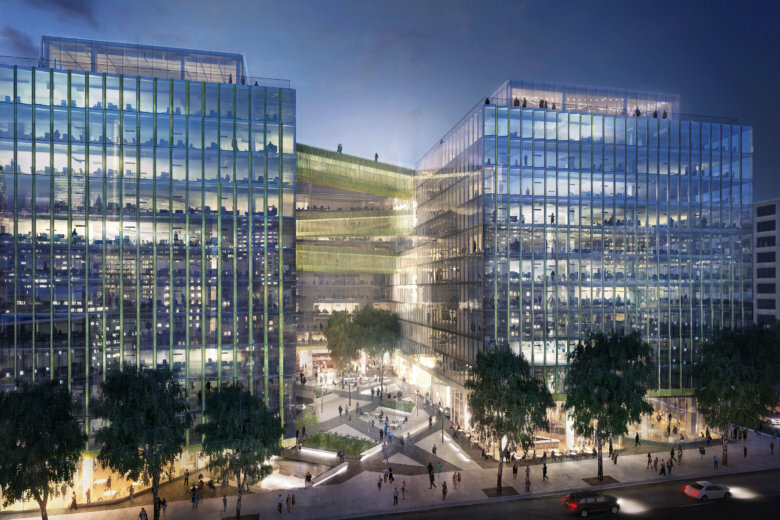 Midtown Center, the $650 million, 862,000-square-foot pair of glass buildings at 15th and L Streets N.W., owned by Carr Properties and serving as the new headquarters for Fannie Mae, ranks as the 6th largest office project in the country to deliver in 2018. Commercial Cafe, citing information tracked by commercial real estate research and data firm Yadi Matrix says new, large-scale office projects in major cities across the U.S. in 2018 total about 101 million square feet. The San Francisco Bay Area leads for new office construction in 2018 with almost 11.1 million square feet completed or scheduled to deliver before the end of the year, and 7 million square feet of that is directly in San Francisco, ranking the area fourth. New York City, including Manhattan, Brooklyn and Queens, ranks second, with nearly 10 million square feet. Dallas-Fort Worth ranks third, with 7.7 million square feet of new, large-scale office space in 2018. Boston ranks behind the D.C. area, at 3.6 million square feet. Austin, Philadelphia, Denver and Atlanta round out the top ten markets for new, large-scale office construction, based on square footage, in 2018. The largest new office project to deliver in 2018 is Silverstein Properties’ 80-story 3 World Trade Center in New York, at 2.8 million square feet. Salesforce’s new headquarters, Salesforce Tower in San Francisco, owned by Boston Properties, ranks second, at 1.4 million square feet. JPMorgan Chase’s new JPMorgan Headquarters at Legacy West in Plano, Texas, which is 75 percent wind-powered, ranks third largest, at 1 million square feet.